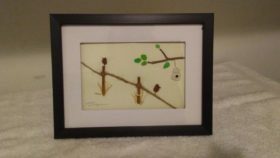 Learn a little about beach glass and make a beach glass framed art piece and drink some wine! Participants are provided all materials to create their artwork including beach glass, or participants may bring their own beach glass for the class or even just for show and tell. At the end of the class the instructor will do a short drilling demonstration, and if class participants want to bring in a piece of their own beach glass for her to drill she will gladly do that for them too. A collection of my hand crafted designs will also be on display for sale., or participants may bring their own beach glass for the class or even just for show and tell.